The Tata Nexon is Tata’s competitor in the sub 4-metre SUV space and has successfully carved a niche for itself since its launch. Like all Tata cars it is big on space but unlike the old Tata vehicles it features better quality interiors with good quality plastics and upholstery that looks premium. Combine that with convenience features such as climate control and a touchscreen infotainment system with Android Auto and Apple CarPlay, which is on par with the competition, and the Nexon emerges as a value for money proposition. Plus, the recent 5-star rating in the Global NCAP crash test has only helped Nexon further cement its position in the market. It is powered by a 1.2-litre turbo petrol and a 1.5-litre diesel engine. Both engines make 110PS of max power but where the petrol makes 170Nm of torque the diesel makes 260Nm. Both engines can be had with a 6-speed manual and AMT transmissions. Tata Nexon prices start at Rs. 6.49 lakh for petrol and goes upto Rs. 9.95 lakh. The prices of Nexon diesel variants start at Rs. 7.49 lakh and the top-end diesel is priced at Rs. 10.90 lakh. Tata Nexon is available in 22 variants and 6 colours. The claimed ARAI mileage for the Tata Nexon petrol is 17 kmpl, and for the Tata Nexon diesel is 21 kmpl. The Nexon brings a dose of freshness to the compact-SUV game. There's a lot to like including the design, features and the diesel engine. But, there are a few gremlins Tata needs to address with respect to fit and finish, so do keep an eye out for that. Q. Which one is best petrol car under 8 lakh? Q. Which is best to buy Ertiga ZDi Plus and Tata Nexon XZ Plus? Nexon, any-day. Space, styling, power, performance, features everything is good. Q. Tata Nexon XE vs Baleno Sigma which car is better to buy? Q. Which is better Tata Nexon diesel or Ecosport diesel? If I had to choose on basis of drive pleasure I would go with Nexon Diesel. Q. Elite i20 Asta Option Vs Nexon XT or higher version? I'm confused between two overall. Seriously hate the interior quality of Nexon though. The quirky styled Tata made quite the splash when it launched last year. But the two powerful engines were missing an automatic transmission. Are the Nexon XMA and XZA+ just filling a gap in the specification sheets or is the HyprDrive S-SG 6-speed really worth considering? Is the wow factor on Tata’s Nexon more than skin deep? Should the segment champ, the Maruti Suzuki Vitara Brezza, be spooked? All questions answered here. 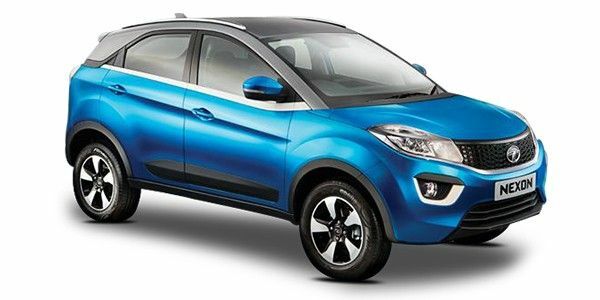 Tata Motors changed the way we looked at the Indian carmaker when it first showcased the Nexon. It might have been a bit rough around the edges when we first drove it, but it also showcased just how far Tata Motors had progressed since it ventured into the passenger vehicle space in India back in 1991. The issues we found with the Nexon petrol manual were rectified in the petrol AMT, a clear indication that Tata seems to be on the right path. The Nexon has always been a looker and the new Etna Orange paint is bound to turn even more heads. The quality of the interiors is pretty impressive, especially in terms of the choice of materials and their soft-touch feel. The Tata Nexon is powered by a set of new-age powertrains: a 110PS/170Nm, 1.2-litre turbocharged petrol engine; and a 110PS/260Nm, 1.5-litre turbocharged diesel engine. Both engines are available with the choice of a 6-speed manual and a 6-speed AMT. The Nexon is the only car in its segment to offer an AMT with both petrol and diesel powertrains. To commemorate Nexon’s first anniversary in India, Tata also introduced the Kraz (pronounced ‘crazy) trim in two variants, Kraz and Kraz+. Both variants are available with both petrol and diesel engine options and are based on the XM and XT variants respectively. Priced between Rs 6.22-10.66 lakh (ex-showroom Delhi), the Nexon has primarily got the Maruti Vitara Brezza in its crosshairs along with the Ford Ecosport and Mahindra TUV. Tata’s Nexon stays true to the concept it’s based on. The shape, size and surfacing has remained virtually unchanged, and only the showcar bits like the humongous wheels, and fancy lights have given way to what’s usable on a daily basis. This might not be your traditional boxy SUV, but it does demand a lot of attention. If you see one on the road, especially in a bright shade like red, blue or orange, we’re sure you’ll give it a second look. The projector headlamps with daytime running lamps, machine-finished 16-inch alloy wheels and LED tail lamps lend the Nexon some flair. We also like the use of the ceramic finishers under the window line and the use of dark grey on the boot lid. Inside the cabin, there’s an intuitive design that wows at first glance. But, there are snafus when it comes to practicality. For instance, the USB port is hard to reach, the central cubby is deep and narrow and you don’t get proper cup holders either. But these are quirks you’ll learn to live with pretty easily. On the features front, the Nexon doesn’t disappoint. There’s a 6.5-inch touchscreen with Android Auto and Apple CarPlay, a reverse camera, steering-mounted audio controls, rear AC vents and a Harman audio system. We’ve got no complaints on the space front, and the 350-litre boot is more than adequate too. Safety features include dual airbags, anti-lock brakes (ABS) with EBD and ISOFIX child seat mounts. All of these features are offered as standard. Tata’s Nexon can be had with two engines — a 1.2-litre turbocharged petrol, and a 1.5-litre diesel. Pick the petrol and you get 110PS/170Nm to play with. Opt for the diesel and there’s 110PS and 260Nm at your disposal. Both engines get the option of a 6-speed manual, or a 6-speed AMT. Notably, the Nexon is the only compact SUV to offer the optional AMT with both petrol and diesel engines. Further, you also get three driving modes, namely Eco, City and Sport. Between the two, we like the diesel for its extra torque. If you’re tilting in favour of the petrol motor, get the AMT - it just drives better than the manual. Tata Nexon variants include XE, XM, XT, XZ and XZ+. All of these variants are available with both engine options. If you want the AMT, that can be had in the mid-spec XM variant, and the top-spec XZ+ variant. The Nexon AMT variants are called XMA and XZA+. Tata also offers a Kraz (based on XM) and Kraz+ (based on XT) variant that feature an exclusive black paint job with neon green highlights. The base-spec variant can be skipped as it packs nothing more than the essentials. Based on your budget, pick between the XM or the XT variant for most bang for buck. In the XM you get goodies such as steering-mounted audio controls, electric adjust for the ORVMs, and reverse parking sensors. The XT adds some more convenience in the form of automatic climate control, rear AC vents and electric-fold for the mirrors. With the XZ, you get some more bling in the form of projector headlamps, a touchscreen infotainment system and an 8-speaker audio system. The top-spec XZ+ variant rounds things off by adding finishing touches like daytime running lamps, alloy wheels, keyless entry and push-button start. Maruti Vitara Brezza: Arguably the best package in the segment, the Vitara Brezza is built for India and has everything that the average buyer wants, and nothing less. The 1.3-litre diesel is now offered with an AMT (read the review here) as well. The 5-speed manual transmission and a rather stiff suspension setup work very well to give you a sporty drive. Not to mention, it has all the space you will ever need. Ford EcoSport: The EcoSport is the oldest member of the sub-4 metre SUV family and the recent facelift along with the addition of new engines and variants has refreshed its appeal further. It looks like a sporty little SUV and particularly shines in the handling and safety department. The engines on offer pack everything a buyer could hope for - strong performance combined with impressive efficiency. Sadly, there is no automatic on offer with the diesel motor, while the petrol-AT combo is priced at quite a premium. Honda WR-V: Honda was the last to enter this space. The WR-V is based on the Jazz, but that’s where their similarities end. It gets a lot of goodies that include a sunroof, aggressive looks, high ground clearance and a big boot. Did we mention it has a sunroof? Eyeing Tata’s Nexon? Go for it. It’s well built, safe and reasonably good to drive. You’ll have to live with a few quirks in the interior, and some unpolished bits and bobs here and there, though. It's a great car from Tata Motors and feels like way ahead of the segment.